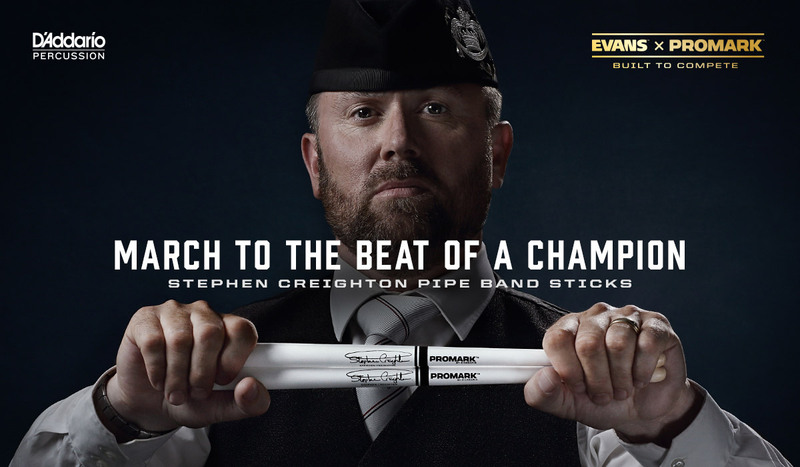 Promark by D’Addario is thrilled to welcome Stephen Creighton to their percussion artist roster and launch the Stephen Creighton PBSC and Stephen Creighton ActiveGrip PBSC signature sticks. These will be the first products that the brand introduces to the pipe band market. Stephen Creighton is a world-renowned pipe band drummer and Drum Sergeant of the St. Laurence O’Toole Pipe Band in Dublin, Ireland. Throughout his career, Stephen helped lead the band to British, European, Scottish and over ten All-Ireland Grade 1 titles. He also led the drum corps to a world title and the band placed third overall at the 2016 World Pipe Band Championships. Stephen is also an accomplished soloist and has been consistently in the top twelve senior drummers for eighteen of the last twenty World Solo Championships. He has seven All-Ireland solo titles and is known for his musicality and tonal perfection. The Stephen Creighton PBSC Signature Stick will be available in July, 2017 in three finish options. Standard lacquer, painted white and ActiveGrip™, Promark’s patented, heat-activated grip coating. This entry was posted in Percussion. Bookmark the permalink.